During her elementary school days, her dream was to be an archaeologist or an explorer. To seek for unknown living creatures or relics, to continue to explore the world, how fascinating that feeling would be. That was what her immature mind thought and admired. She wrote down everything she could think of in a schedule for her summer vacation. Search for an Eel dog in the woods. Exchange mails with the UFOs on the hills. Excavate some relics in the forest. Pat the snowman sleeping in the summer. Life was short, yet she had so many things she wanted to do. She could only look for a Tsuchinoko on the hills during this summer, fish for a kappa using a cucumber along the riverside, set up an antenna on the hill to call for a UFO, and check the skin texture of a snowman. However, Asai was whisked off to the posh holiday inns in Switzerland, Canada, Karuizawa, and she was not pleased about this at all. One of these days, let us go look for a Tsuchinoko together, Asa. Let us help the kappas breed, and we can create a kappa-themed park. Those were the promises she made to her younger cousin Hikaru. Now in the second year of High School, Asai reflected on her past coldly. Currently, she was burdened with the duty of being the High School Student Council President in Heian Academy, and the eldest daughter supporting the Mikado’s side family, embroiled in the complicated politics and power struggles in the family, an icy girl living in the harsh reality. She had long forgotten about the time she had a cucumber on the fishing rod she leashed at the riverside and did not get anything after 7 hours. The intense sunlight was reflected upon the asphalt, and Asai’s vision was filled with the swaying, sweltering heat as she walked down the shopping street. No matter which street it was, there were young people of all types. Some were standing in the middle of the streets, blocking the way, some were standing around eating ice products and crepes, and some were making all sorts of weird noises; the scenery was in complete chaos. Normally, Asai would pass by the crowds blocking the way with her head held high and an aloof look, forcing them to step aside and form a path quickly. However, on this day, Asai did not have the presence to intimidate them, for they did not notice her as they continued to chat away. She remembered that for the past 2 days respectively, she had only slept for 2 hours or so. Her daily chores had increased exponentially once summer vacation began. The current candidate to be the head of the Mikado family, Kazuaki, was revealed to have forced Aoi to be his wife, and was forsaken by his clan. The Mikado family, Asai and Tōjō were involved and faced a severe crisis. 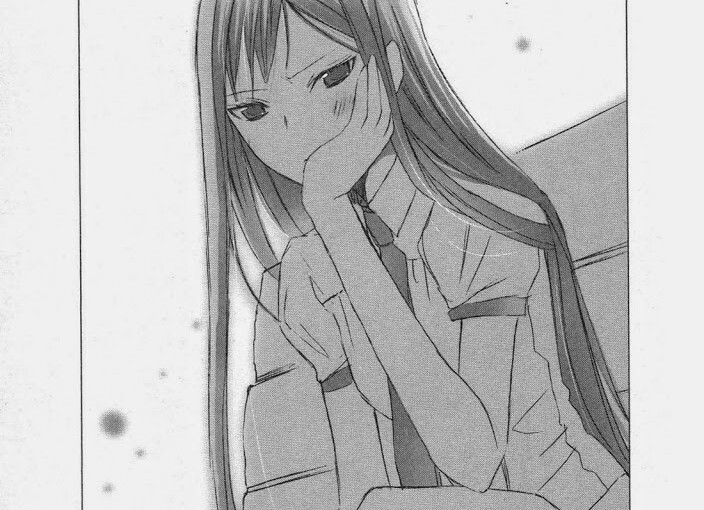 Though her preparations and plots went off perfectly, the unexpected duties and issues came one after another, and she was unable to proceed to the next step. Also, she heard that Aoi went to do some part-time work during summer vacation, so she often had to go to the shop to check on Aoi, feeling really tense, and not daring to relax in the slightest. While she had such terrifying thoughts as she staggered forth. An unlucky flash of red suddenly came out of nowhere and entered her sights. The clumsy fool in front of her called out as he knocked into her. Before she was about to be sent flying away, he reached out to grab her, and pulled her in. If you are trying to try and get girls, do not look for me. Asai was about to wave this hand aside, but she was a little skeptical by what she heard. She lifted her head and stared at the person. Was it her imagination? An illusion? No, it was a mind-boggling truth. It was the vulgar, vile, foolish, wild dog Asai so hated–“Ack!” Koremitsu Akagi called out. Asai then waved Koremitsu’s arm away as she sat on the bench in the park. “I’ll go wet the handkerchief. Just wait here obediently. Koremitsu ran off to the drinking point. Normally, she would not concern herself with such a wild dog trying to accost on the streets. Due to sleep deprivation and the summer heat however, she would feel dizzy whenever she stood up. Her frowning face closed its eyes, and she fell into a deep slumber. It was an hour later before she woke up again. She opened her eyes, wondering why this pillow was so hard and uncomfortable. The sidelong view of Koremitsu’s frowning, slightly tanned face was closer to Asai’s sights than ever, causing her heart to nearly cease to beat. Did I actually fall asleep on this dog’s shoulder!? Why! This dog is too stupid. Could he not have stood up and pushed me away? She coldly retorted, but at the same time, she was completely rattled within. She recalled that before she was in her third grade, she would request all sorts of presents from Santa Claus. She wanted the Swiss Army Knife or sleeping bags, necessities for an adventurer, but she would get antique dollhouses, accessories, or a basket full of tea sets for girls to use. The worst of it all was during her third grade, early in the morning of Christmas; she found a gold card in her sock. Santa Claus actually gave me a gold card? She was thoroughly shocked to know of this truth. This Santa Claus is actually my parents? And to add insult to Asai’s pride, Aoi and Hikaru, who she assumed to be more innocent, had already known about this. Am I the only one hidden in the dark about this!? This shame of a memory was etched deep within Asai’s mind, and ever since then, she loathed both Santa Claus and Christmas. 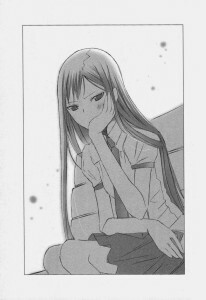 That past of her was mentioned by this abomination of a person that she was sick of–the person who proclaimed himself to be Hikaru’s friend and representative, Koremitsu Akagi. To top it all, she was teased by him. And so, Koremitsu pointed it out as ‘Asai’s laughable past’. This callous remark broke the limit of Asai’s patience. I do not wish to be called cute or anything by anyone in this world! Let alone that Koremitsu Akagi! Her face searing, she gave Koremitsu a slap the next instant. Koremitsu frowned as he glared back. At that moment, a policeman just so happened to appear. She calmly stated as she pointed at him. Koremitsu was whisked off by the policeman as he continued to lash at Asai. It is best if I do not meet that sort of person who left me in a pig pen. However, that man with the obstinacy of a cockroach will definitely appear in front of Aoi again after he is punished. Thank you for your hard work. this chapter is one of those in drama cd right? thank you~~~~~ I love Asa’s storys! !